Naomi Klein’s newest indictment against the profits of war, the privatization of our well-being, and the widening of class and race gaps, or what she terms “Disaster Capitalism,” got me thinking about art as a byproduct of our luxury economy. Klein describes a complex construction wherein the business of repairing natural or manmade destruction accidentally privileges the haves and condemns the have-nots to prisoner status at best. The divide manifests itself most clearly in the workings of our infrastructure – our schools, hospitals, bridges and levees. Klein’s assertion is that privatization is perceived as the most efficient way to recovery after a disaster, and yet it has proved to help only those who can afford it. The result, she claims, is “social engineering,” or the programming of a mass consciousness, a term that nods to Nazism and rings with the strangeness of a sci-fi fiction. And yet, the force of Klein’s examples proves that we are living in very close proximity to a very diabolical machine; perhaps, even, we are inside of it. How does culture get wrapped up in the economy of our demise? The practice of art is often seen as a responsive or reflective state rather than a generative or productive one. But art and culture, like disaster capitalism, is structured through a strengthening of class definitions and profit margins. There is bourgeois art; art made from poor materials; art about exile; art about the loss of nature. While we might be having a John Baldessari moment to say that art about global warming sells better than art that stakes no claim in the Green movement, based on a monetary model, indicators such as the frequency of Green-themed museum exhibitions and the trendiness of composting among a young generation of artists show that “Green” as a cultural ideology is doing very well. Not that this is a money-making issue, but it’s an apt metaphor for progress, competition, and opportunistic awareness. Art of environmental, political, and ideological awareness is prevalent and at a fever pitch, even to the degree where a dissenter’s voice is being heard, even where cowardly silence is a welcome reprieve. Art is one of the rare few things that is self-critical of its workings, and so it is often at odds with itself, and readily recognizes this. 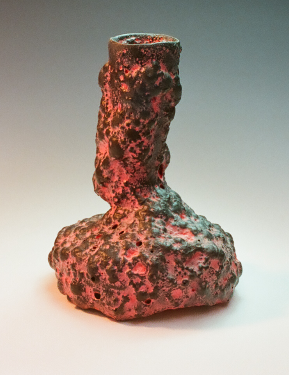 Don Pilcher’s ceramics embody a clash; they represent both decay and sustainability. Ceramic is, of course, of the earth, and once shaped into jugs and bowls, its form is almost as timeless. In Pilcher’s hands, traditional structures are re-invented. It’s not only that these structures wear a patina of antiquity that make them statements in material transcendence, or that the vessels sometimes have holes or are caving in on themselves and are functionally lost, or that a subtle beauty can be found in the fate of gravity and fire, but that these proud little paradoxes gloriously strive toward their own demise. They contain not water nor grain, but mortality. Turning away from the mountain of their own creation, they declare to have no earthly purpose except as objects, eternally dying. Formed from the foundry of Pilcher’s imagination, his vessels produce no clear ideological stance, yet they are products of an age where no gesture goes left ideologically unclaimed. Why, then, do Tara Donovan’s shimmering Mylar pods knock so loudly at the door of environmentalism but find the viewer hiding behind their own shameful love for being entertained? Being truthful need not always equal being straightforward. Bob Jones makes little nothings. 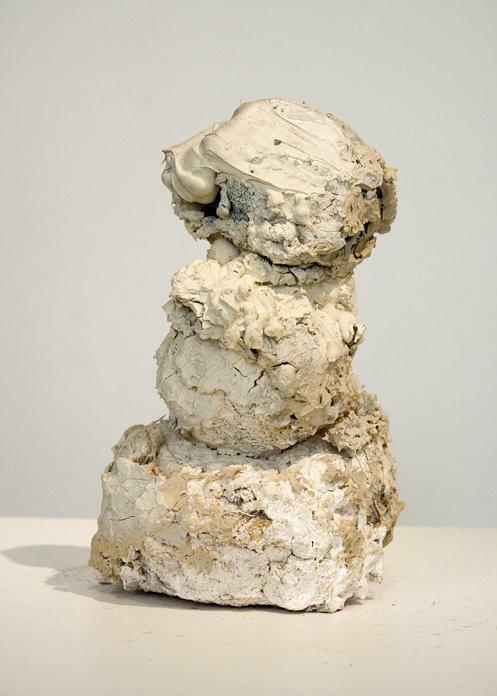 His current exhibition features five objects and one painting. With the exception of the painting, which cannot get away from the fact that it is art because of its traditional right-angled support, the objects verge on being junk. Are the hand-made concrete rock and the stick covered in plaster really necessary objects? No, but they are necessarily inadequate objects, made to express a defect – a shortcoming and an escape. They are complex objects not because of their contextual status as art, but because they are so preciously anti-precious. The lack of force in these objects proves that Jones has nothing to gain from feigning ideological concern, cultural or otherwise, yet they are wasteful objects, purposefully unresponsive. Sometimes they are literally composed of the waste of other artworks in process. All this is to say that the byproduct is more telling or more representative of our varied crises than intentional strides at doing the right thing. Contemporary art is a byproduct of culture – no, is a symptom of the common awfulness that is mass-market hysteria for something meaningful. If we wallow in it, rather than celebrate it, then we’ll really know what it means and how it feels.